Preheat oven to 350°. In medium bowl, whisk together cake flour, sugar, graham cracker crumbs, baking powder, and salt. In large bowl of mixer, cream peanut butter and butter. Add eggs, sour cream, and vanilla. Add dry ingredients to creamed mixture alternately with buttermilk, beat on medium speed for 2 minutes. Spread batter in well sprayed 13″x9″ pan. Bake for 30-35 minutes or until a pick inserted in center comes out clean. Cool completely. Beat butter, cocoa, 1 cup powdered sugar, 2 Tbl milk, and vanilla. Gradually add remaining powdered sugar and milk to make desired frosting consistency. Spread over completely cooled cake. 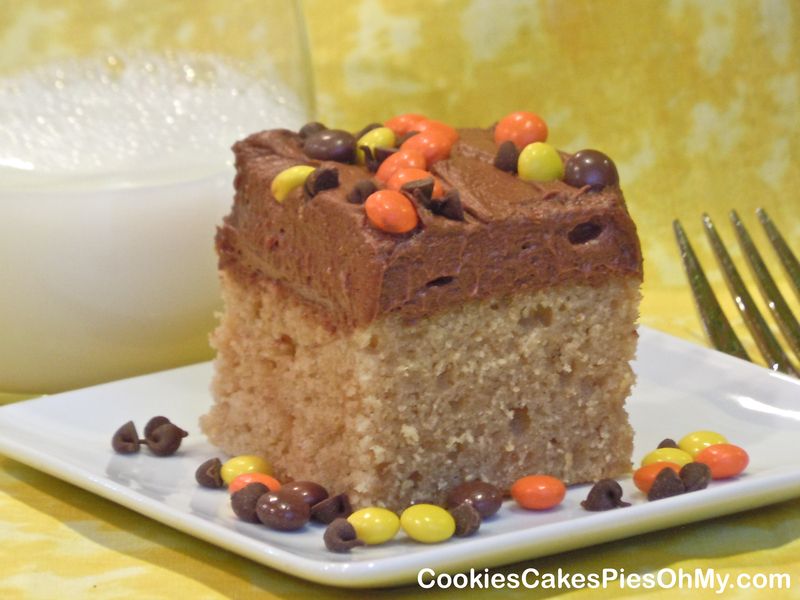 Sprinkle cake with Mini Reeses’s Pieces, I also sprinkled on some mini chocolate chips. Excellent! So glad you loved it, nothing like chocolate and peanut butter! Happy Baking!